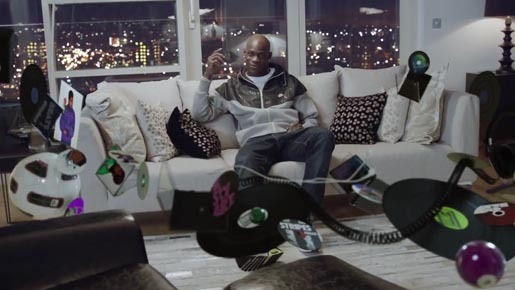 Manchester City football star Mario Balotelli invites us into his apartment in “Stay Ungrounded”, a television commercial for Nike’s new Air Max Lunar shoe, launched by Foot Locker. The soccer player answers the door to his apartment, inviting us to follow him into a home in which the rules of gravity do not apply. At the top of the stairs is a special room just for his new Nike Air Max Lunar shoes. The Ungrounded campaign was developed by Nike Football by creative director Gary Horton, art directors Nick Parkinson and Sarah Whittle, and designer Max Gotlieb. Filming was shot by director Asif Mian via 1st Avenue Machine and Stink with director of photography Will Bex, producers Simon Eakhurst and Els Tau, executive producers Sam Penfield and Penny Pijnenburg. Editor was Paul Hardcastle at Trim Editing. VFX producer was Michael Turoff. Music is “Lunar Riddim”, a track by Mnek, produced by Nathan Retro.